One of the greatest things about Crossfit is that it has allowed more adults to be athletes again. It used to be that when you played your final game as a college or high-school level athlete, you were done. Of course you were left with the option to play pick-up basketball on the weekends or prepare yourself for a marathon, but your options to taste victory were certainly limited. The sport of Crossfit has evolved to allow the athlete with advanced age the thrill of competition once again. Now, those athletes that once just went to the gym to get a workout in, are heading to their box with a purpose. With the advent of the Master Level Crossfit athlete, the thrill of competition can seemingly burn a lifetime. I only see athletes who want to keep moving. Some have aspirations to excel and give themselves an opportunity at the Games while others want to just chase around their two year old without wondering if they are going to be able to stand back up after they bend from the hips. Each one of them comes to see me because they are hurting and can’t understand why. I have found a link between the injury history of the athlete and functional anatomy. It is important to first understand what the foot-ankle complex is responsible for before being able to grasp why this seems to plague the masters level athlete. The primary role of our foot and ankle is to slow down our leg as we come in contact with the ground. This means that every time our foot hits the ground when we run or jump, our ankle has to have enough “give” in it to allow gastrocenimus (calf muscle) to stretch out and slow the knee from traveling forward. Therefore, our knee health is really dependent upon a gasctrocenimius that can fully lengthen. Considering how much we are on our feet and the rigors we put it through during Crossfit WODs, it is no wonder that we need full mobility and stability in this joint. Many master level athletes don’t though. 1.1 The number one reason for injury/pain is a previous injury. When looking into the history of the masters athlete a common thread is a previous ankle injury. In my experience, most times this means a sprain of varying degrees. This cooperates with the fact one in every six high sports injuries is an ankle sprain. Most Master Level athletes have fallen in love with Crossfit because it has allowed them to rekindle that fire to compete again. It really makes sense that a greater majority of our older athletes have “rolled” an ankle at some point in time during their athletic careers. This allows us the opportunity to highlight the importance of full recovery from an injury. If acute care isn’t started immediately to the site following the injury then the body will respond by trying to protect itself by laying down scar tissue. This buildup of scar tissue is very similar to the calluses that form on your hand. It is very stiff which can prevent mobility and strength but also be very painful. Most athletes that I have worked with can re-enact the moment they suffered their sprain. Their story also include to more important facts. Number one, them just getting right back up and putting weight on their other leg to finish the game. Number two, the sound of crickets when asked how they treated it. So what we end up seeing often is an ankle that is really good at pointing their toe (plantar-flexion) but can’t pull their toes upward (dorsiflex) very well at all. This puts the brain in a position in which it must figure out another way to slow down the knee. As a result this means that the quadriceps (thigh) and the Achilles tendon (connective tissue that connects the calf to the foot) get overly stressed. Duck stance. One of the most common postural deviations that I see in Master’s level athletes is a toed out, flat footed stance. Most of the time it is on the one side only but it can also easily be both. The daily fix: Start by restoring the soft tissue structures in the arch. Use a golf ball everyday on the bottom of your foot to relax overworked tissue. Continue up the chain, by doing some self-massage on your gastroc complex. Get yourself some custom made orthotics to prevent over-pronation. Be patient, you can get your arch back, but you will at least seven months of being consistent. Most Master athletes will come to me complaining of the back pain but remembering that ankle joint history may also be important to understanding why the pain is occurring and proving to be the key into creating a fix. What we need to understand is that the foot isn’t just the foot, it is also the ankle. Since the ankle is connected to the tibia and fibula (lower leg) which ties into upper leg (femur) at the knee, the ankle is also the hip because the head of the femur rests in the acetabulum of the pelvis. Changing the position in which the femur sits inside the pelvis can change both the orientation and function of the pelvis. Considering the number of muscles that cross the pelvis and attach to the spine this has many implications to both pain and performance of our athletes. To best understand how the ankle can be the culprit for back pain, we have to go back to the incident itself. The typical response when we roll an ankle is to avoid putting weight on to the injured side. When we favor one side over the other, we end up asking all the structures on that side of the body to pick up the slack. This means that bones and joints get moved out ideal positions. In doing so, the muscles attached to these bones change in their length-tension relationships with one another. This proves problematic when the brain is trying to co-ordinate movement patterns. Ultimately what happens is that our brain creates a compensation and we end up using muscle improperly, thus opening the door for all kinds of injury. Uneven hip height. Watch the waist band of athlete or wrap a piece of duct tape around their waist line to observe if one hip is higher than the other while they move. What you will see is that an athlete likes to load one hip more when they perform exercises in which they bend at the hips and knees. You can confirm uneven hips be measuring the position of the asis on both the right and left pelvis. 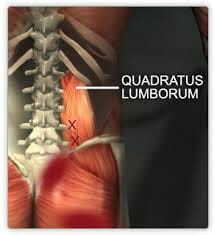 The daily fix: On the side that is higher, relax the Quadratus Luborum with a tennis or lacrosse ball. The QL attaches from the top of the pelvis to the lower lumbar and shortens up to hike the hip. When this muscle is chronically shorten it can effectively make the length of the legs uneven. This can have huge ramifications for all movement for force is absorbed from the ground up. 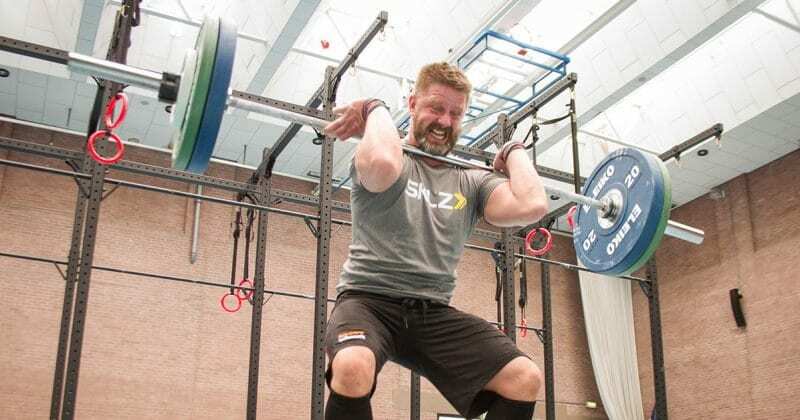 Considering that many of the Crossfit exercises involve an overhead position, it isn’t uncommon to have this same athlete complain of pains and dysfunction their shoulder as well. If we continue with the idea that the parts of our skeleton are all inter-connected then we can start at the pelvis to understand why a shoulder might hurt in someone who has hips that are uneven. Remember that the pelvis attaches to the sacrum (tailbone) and the sacrum is an extension of the spine. The sacrum will change its alignment with the direction of the hike of the hip. Since we know that the sacrum is an extension of the lumbar vertebrae, this will ultimately have an effect on the entire spine and all things attached to it. 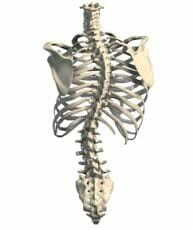 Essentially what happens is a bend that is created in part or throughout the spine. When we understand that the rib-cage attaches at the thoracic vertebrae and that the scapula sits on the back of it, we can easily understand that hip position can influence shoulder position and function. If there is bend in the spine that continues from the lumbar region into the thoracic region it will often push the scapula upward and outwards. Effectively what occurs is a poorly functioning scapula which limits the mobility and stability of the shoulder to do things like lifting the arm overhead. Watch the height of the bar from left to right when pressing overhead. If you see one side that is clearly higher than the other, let that be a clue that the scapula isn’t moving too well. Check to see the shoulders are protracted. Being able to slide your hand underneath the border of the scapula is an indication that your scapula is poorly positioned. The daily fix: A protracted shoulder will also be internally rotated, which presents a problem for getting into an overhead position. Chronically in protracted and internally rotated position weakens that the external rotators of the shoulder. First try relax the anterior structures of pectoralis and anterior deltoid with either a soccer or softball. Then try to fire up the weakened external rotators, by performing some banded pull-a-parts. When it comes to movement it really isn’t always a matter of just “doing it.” Sometimes there are positions that the structure of our body just isn’t going to allow. Our brain is so magnificent that will run through many structural barriers to get the job done. The end result typically means more pain and less performance. Follow Jeremy McCann on Range of motion.